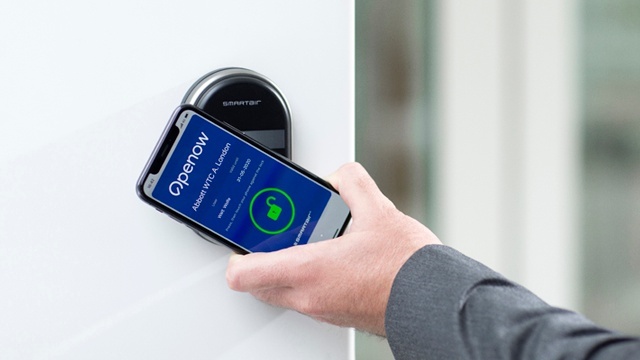 Given the critical advantages wireless technology has over both mechanical locks and wired access control, we would expect to find the market moving steadily towards wireless. 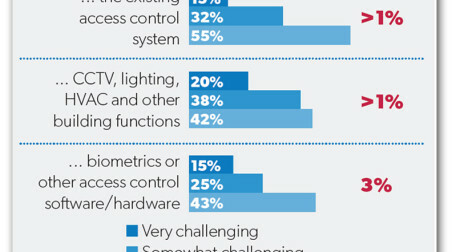 Following up on the 2014 survey, this new report certainly backs up that expectation. 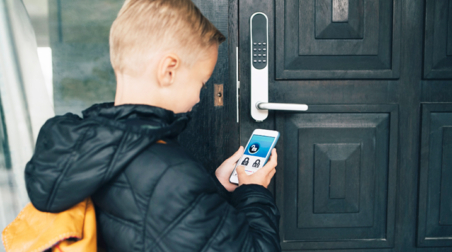 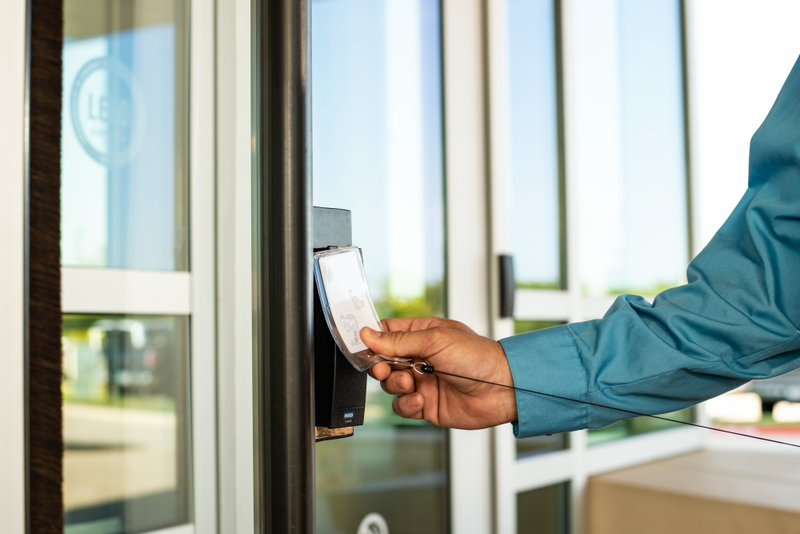 The report also examines how electronic access control can secure openings and areas other than standard doors and entrances, like IT servers, safes and outdoor structures. 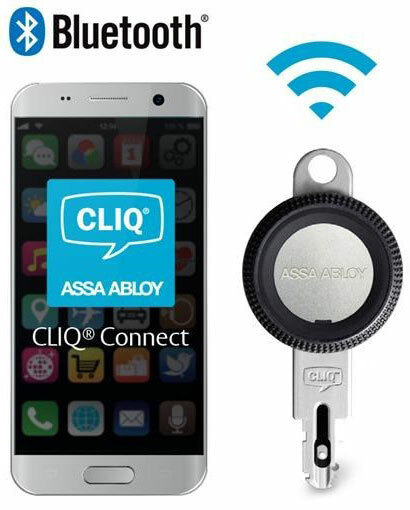 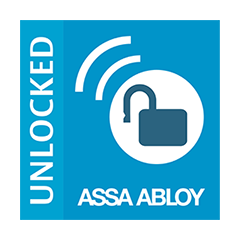 Two years ago IFSEC Global.com and ASSA ABLOY published a white paper on wireless access control. 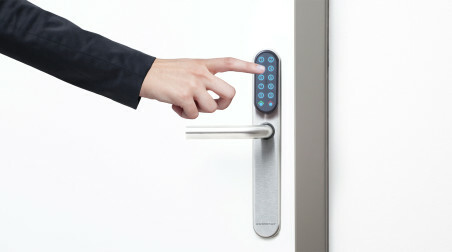 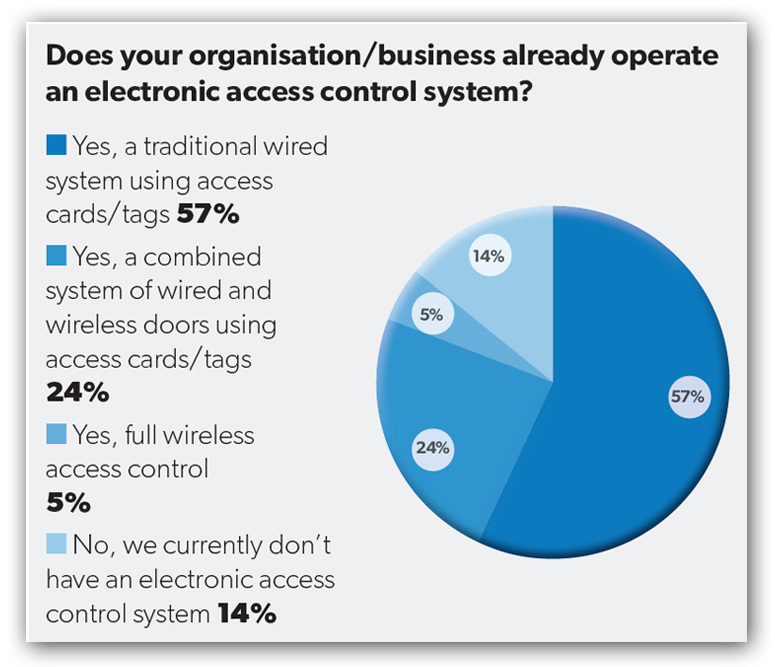 The Wireless Access Control Market in 2014 report surveyed security professionals, facilities managers and commercial building owners, enquiring about the kinds of systems they had installed. 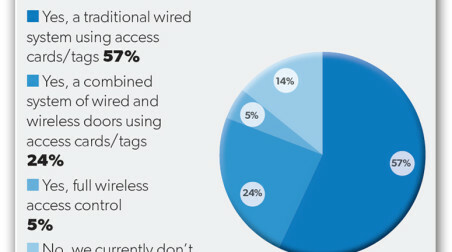 It researched perceptions of both wired and wireless systems, battery-powered locking components. 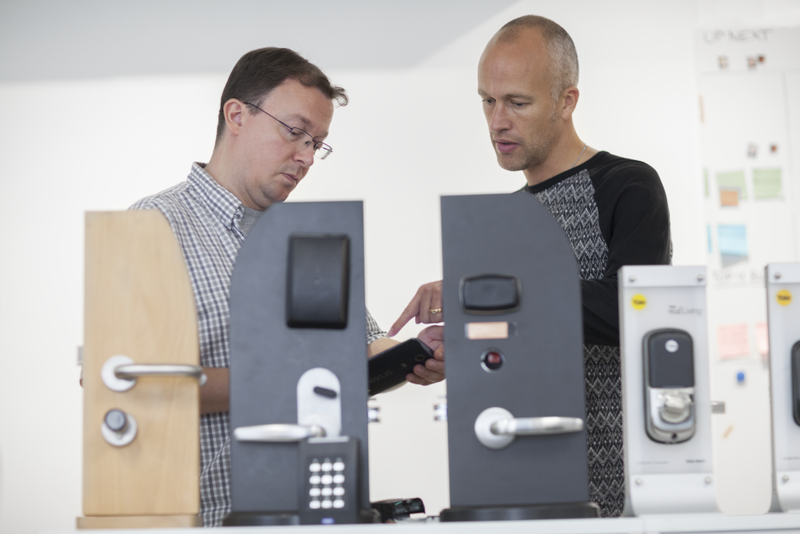 But we also researched how many commercial premises still rely on mechanical keys in 2015. 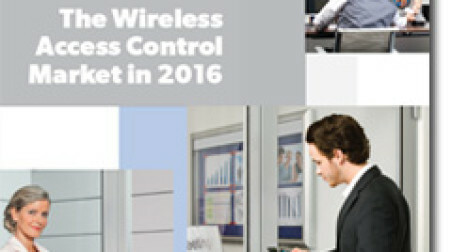 The 2016 report examines further issues around wireless systems – including training requirements, from where wireless systems are sourced and wired versus wireless access control from a security and cost-effectiveness perspective. 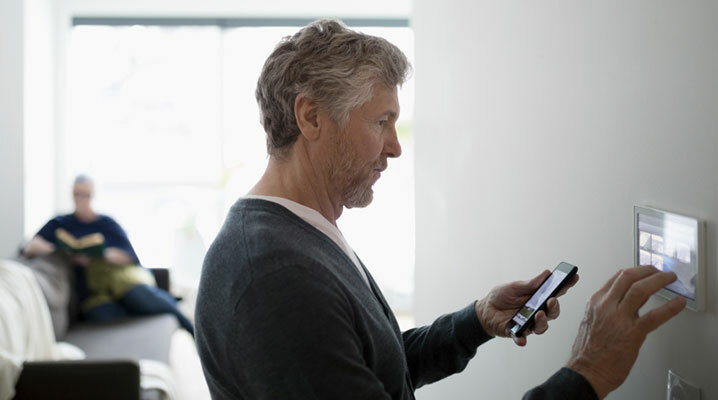 Of the security professionals, facility managers and other access control stakeholders we polled just one in 20 operated a fully wireless access control system. 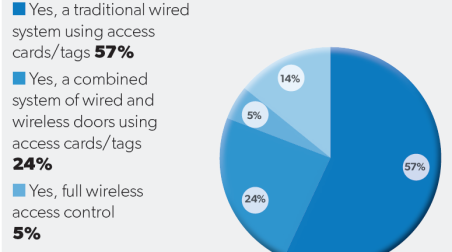 A further 24% had a combination of wired and wireless systems. 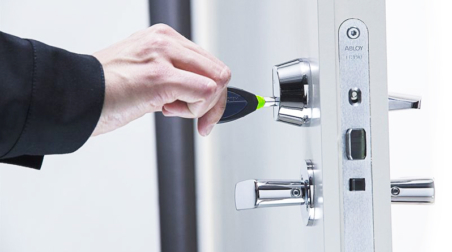 Discounting those without any kind of electronic access control, the numbers with fully and partially wireless systems are 6% and 27% of installed electronic solutions respectively. 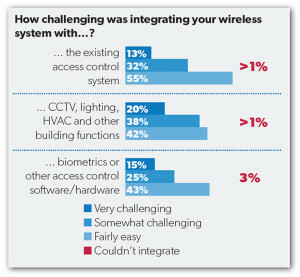 Those who did operate a wireless system were asked to what extent integrating it with an installed system was a challenge. 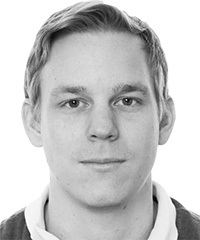 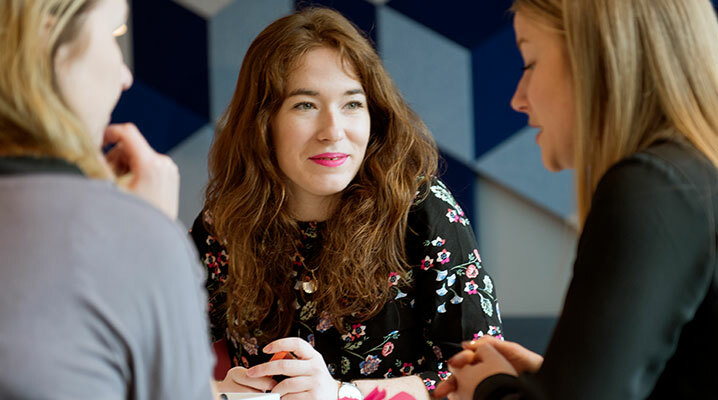 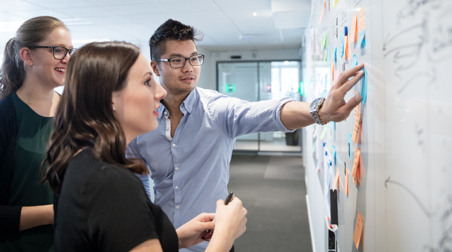 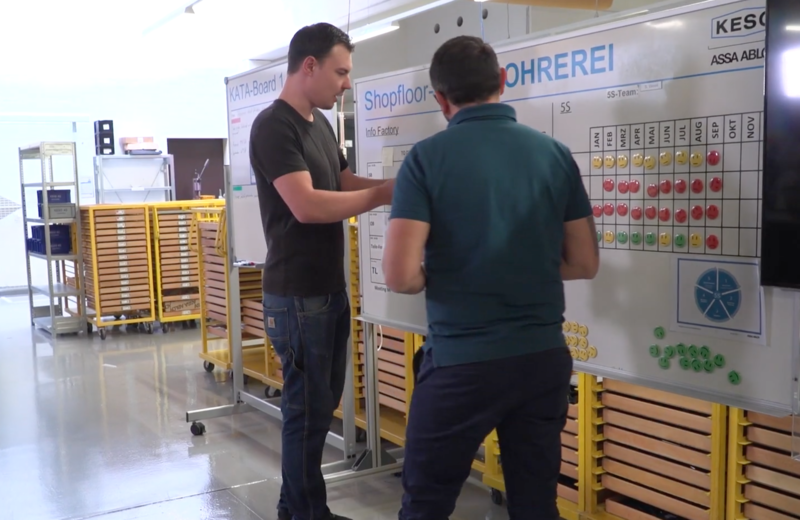 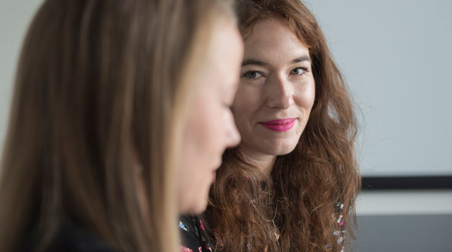 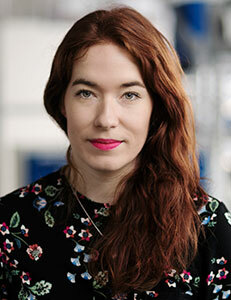 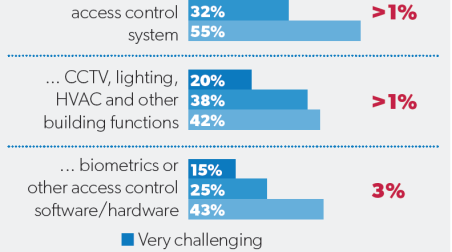 With building systems – everything from HVAC systems and lighting controls to CCTV and fire detection – becoming increasingly interconnected and data-generating, the era of the ‘smart building’ has arrived. 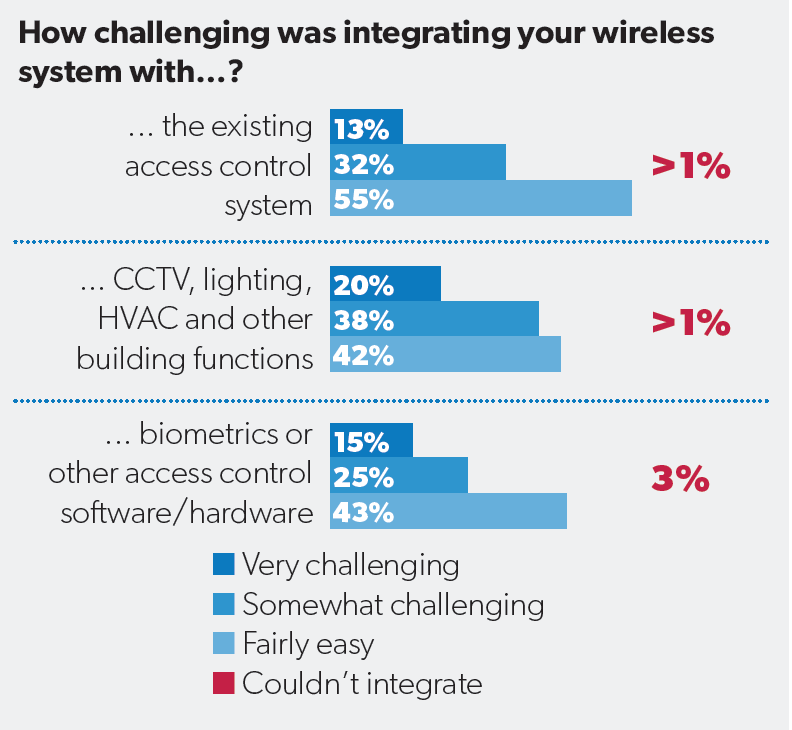 Unsurprisingly, then, 86% of respondents with a wireless system had attempted to integrate it with CCTV, lighting, HVAC or other building functions. 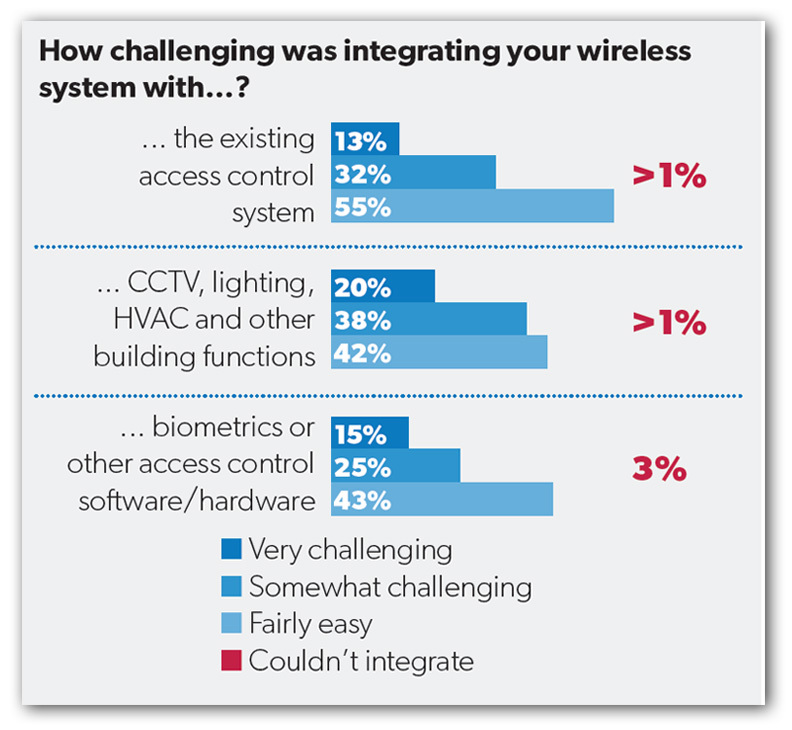 Interestingly, 80% rated the integration task no more difficult than ‘somewhat challenging’, with 42% finding it ‘fairly easy’. 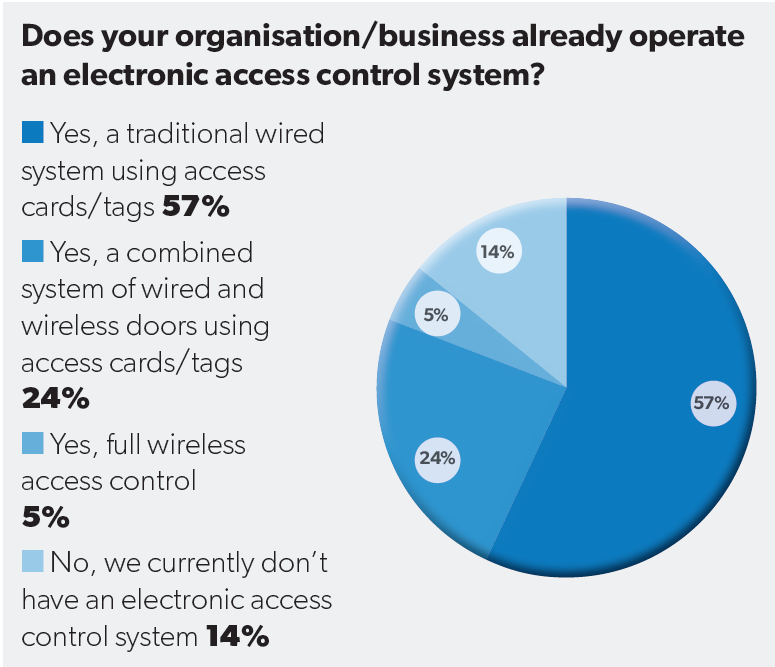 So to summarize this first part the of 2016 survey report; for those with experience of the process, integration of wireless systems is not seen as a major challenge, whether it’s a new access control installation or an upgrade to a building management system. 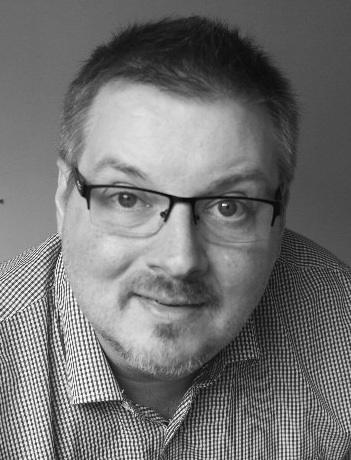 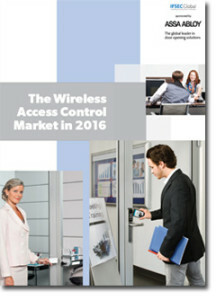 Stay tuned for the next part of The Wireless Access Control Market in 2016.